July 13, 2016, ©. 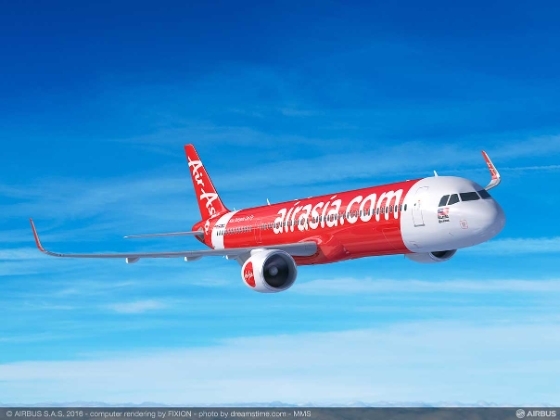 Leeham Co, Farnborough Air Show: AirAsia Group Chief Executive Tony Fernandes said yesterday that increased congestion the group has seen for several of the airports AirAsia operates to in the Asian market motivated an order for 100 Airbus A321neos. “We are slot constrained on several of our destinations and when we can’t get any more slots from an airport, it’s better to take-off with the 50 more passengers that an A321neo offers rather than the 180 seat our standard A320 have,” said Fernandes. “The congestion has grown to the point where it will no longer be optimal for AirAsia to only operate with our standard-size aircraft, our fleet of 200 A320ceos with 180 seats, which will be gradually replaced in coming years by our order for 304 A320neos with the same seating,” Fernandes said. Fernandes sees airports with slot constrains in several of AirAsia’s key markets. “We are experiencing constrains already in Hong Kong, India and Singapore and we expect more markets to develop the problem. The authorities are working to increase capacities but we see no other immediate solution then getting aircraft that can transport more passengers per start and landing. “This is a problem which is a recent development. We had not expected to order the larger A320 models by now. When we started the discussions with Airbus for the larger model, it soon became clear that we needed to mix in a substantial quantity into our standardized A320 fleet. We are fortunate to work with a vendor that could offer us this flexibility as part of its product range,” Fernandes said. Congestion will make the A380 Neo a great success. Haters and Aboulafia can rage all night on this. Sir, when you bring forth the “hater” label you have lost the argument! Quite right, everybody(except Boeing extremists) loves the A380.The question being asked is whether it can do anything other than lose Airbus lots of money. One does not have to be a “Boeing extremist” to not “love” the A380. I’ve flown in one twice now – round-trip between SFO and Frankfurt on Lufthansa and while I was impressed with how its bulk means it doesn’t bump around as much as smaller aircraft, sitting in steerage didn’t seem appreciably different than sitting in steerage in any other aircraft in which I’ve flown. Given the A380 doesn’t look like it is on track to recoup the development costs, being very much short of the break-even point in terms of sales, would a NEO really make any sense? It seems like throwing good money after bad. As a vanity program I suppose, but from an actual euros and sense point of view? The A380 is built around the strategy of hubs and spokes. Its designed for the hub to hub part. I think its development is dependent on strong growth in the global economy which we are not seeing. So it ends up being a slow burner. It will die if its not at least reengined, maybe even rewinged, and can that development cost pay for itself? As for the A320/1 Neo. Its the perfect plane. It can cover point to point and short turn around, even at distance with the A321 NEO LR coming. Its cost is reasonable and has competition in the engine department with PW’s GTF and leap. Its the biggest winner since the 787 but with much lower development costs. Its going to go down as the big winner of the decade really. I dont see the A380 being hubs and spokes- thats mainly a US domestic concept which even now has waned. The A380 actual usage reflects the very long range sectors where you are time constrained by largely overnight flights which have a evening departure with high boarding’s and fly through the night. The rest of its sectors are just mega cities connecting each other, often with the airfield conditions that tend towards 4 engines rather than two. Emirates is a mix of all 3 types: hub, long range night and airfield constraints. Next thing I expect to see is Air Asia defer the A320s and replace them with A321. Not sure when he stops kicking the can down the runway. AirAsia´s profits have gone up about 6 fold in the last year according to Bloomberg. I suspect the days of the A320 with them might be limited any way you look at it.